This is something I have always strongly believed in, and an area I continually encourage my pupils to develop with saxophone playing – tone and timbre. So, when we began stocking these at Dawkes, I wanted to see what Snake Davis had to offer in terms of exercises and advice. What’s more, he is a fellow player of Yanagisawa saxophones! Snake Davis is a session saxophonist, who has played with some of the world’s biggest artists including M People, Jamoroquai and Beyonce Knowles. 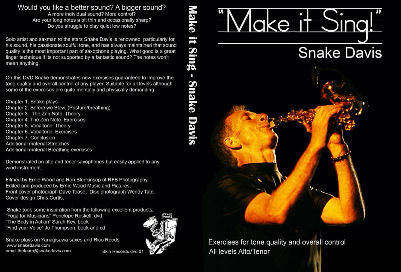 He is renowned for his passionate soulful tone, and this DVD certainly proves that Snake believes that sound is the most vital part of saxophone playing. You can select whether to watch and listen to Snake on the alto or tenor saxophone – both sections covering the same points. The DVD starts with Snake discussing good playing posture and breathing. Within a minute I was immediately struck by his Yoga approach to playing. He talks about balance, energy, and controlled and focused breathing. These are all things we know we should be doing, but Snake conveys the importance to the extent that no practice session should ever be without them. Snake then introduces the “Zen Note”, giving clear advice and instruction on producing a rich full tone on your saxophone. Snake even invites you to play along with him through the exercises. This leads onto “Vocaltone”, where Snake compares singing techniques to playing your horn. He’s not wrong when he describes playing the saxophone as “singing, except you have some plumbing in between the birth of the note and when the sound is produced.” So, Snake encourages you to sing a note and then play a note. He also covers the different timbres possible from your saxophone just by changing the area of where your breath is coming from (diaphragm/chest/throat). Overall, insightful and thought provoking, Snake Davis’ DVD is an accessible resource for both beginners and more advanced players. For beginners, it inspires the player and introduces the importance of sound quality. For advanced players, it is a reminder that even the core values of tone production should never be overlooked.